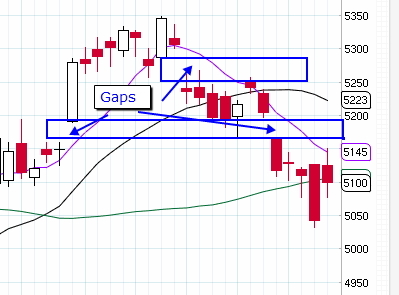 Gap up of 0.5 % is expected with positive bias . 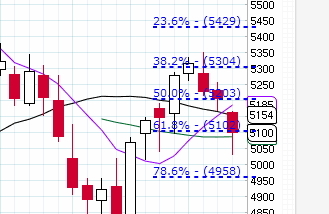 Nifty is taking good support at 5200 level if nifty will open positive then it will go to 5350+ and if it fail to sustain 5200 level then the next support will be 5090..
possible range for next week will be 5100- 5200 extended to 5304 ..
if market participants will fail to retain above 5100 then 4958 will be Fib support ..
Daily chart is showing that large gaps above 5100 are still open and Nifty may try to fill them in coming week so possibility of an upside rally can not be ruled out . 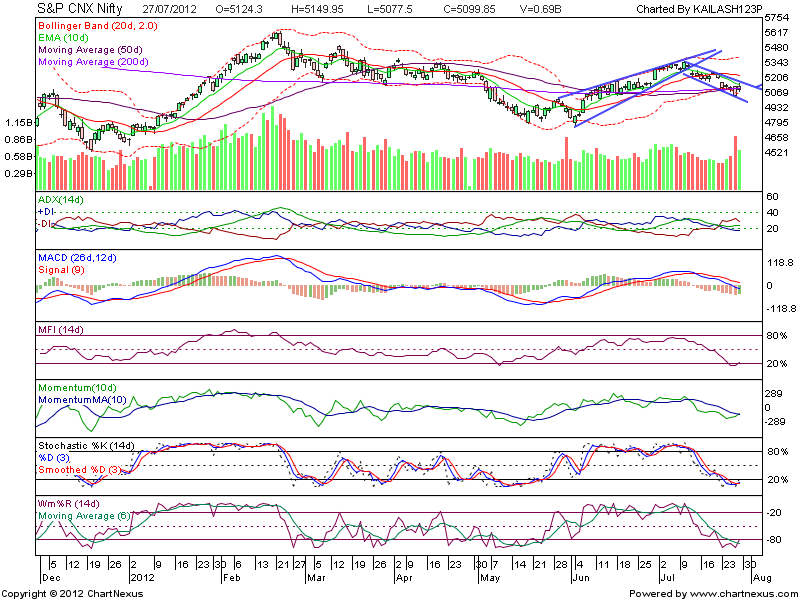 Do you know it is quite simple to learn technical analysis within a month at Dhanvarsha ( on line ) through audio visual means ... and if you can understand English or Hindi you can learn easily and predict markets . 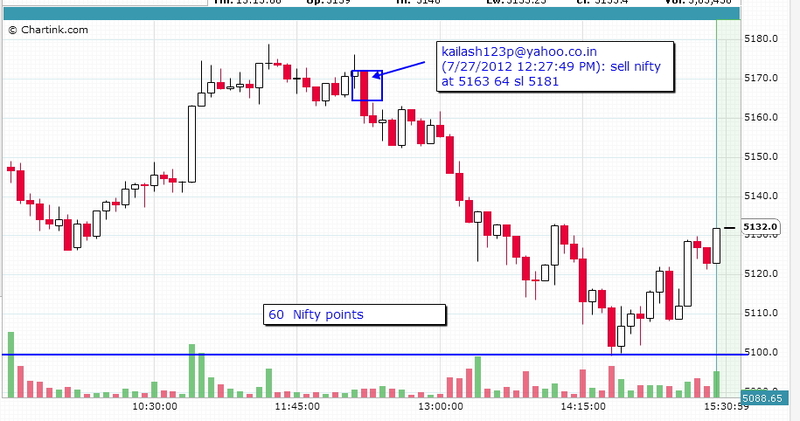 kailash123p@yahoo.co.in (7/27/2012 6:46:54 AM): more than 1% up opening is expected today ...and Market may retain its 5100 level..
gain and losses are part of trading ..
but u must not divert from your aim ..
if u have decided to earn Rs 2000 /- per day on capital of 50k and if u are up ..just stop trades..
Varun (7/26/2012 8:45:31 PM): Sir ek our sell order laga dun? kailash123p@yahoo.co.in (7/26/2012 8:46:51 PM): if u will sell agressively and it retraced then ? 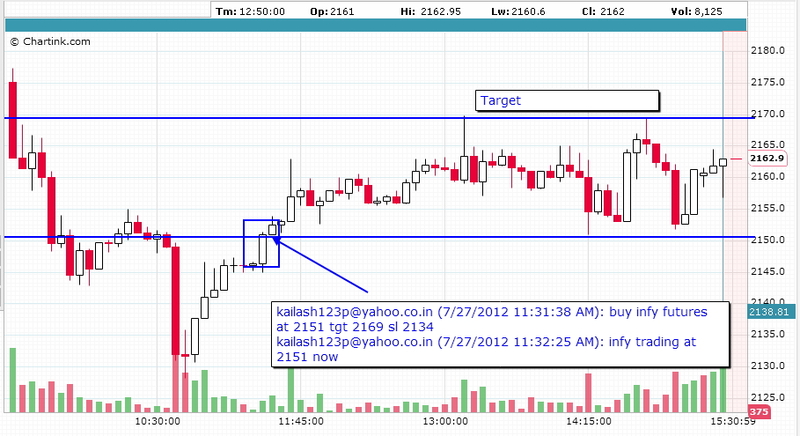 so we will see action in these stocks . 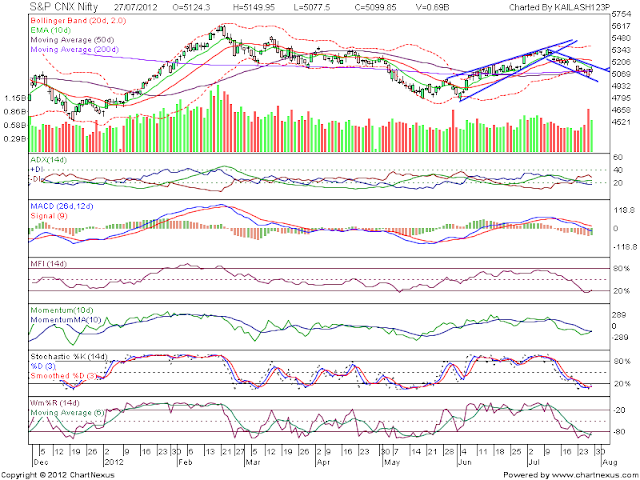 keep these stocks on track . 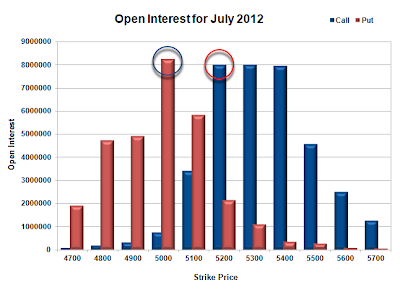 Please close your all in the money options before 3.30 PM and close July futures positions too . You need not to close and pay brokerage for out of money options let them expire at 3.30 today. 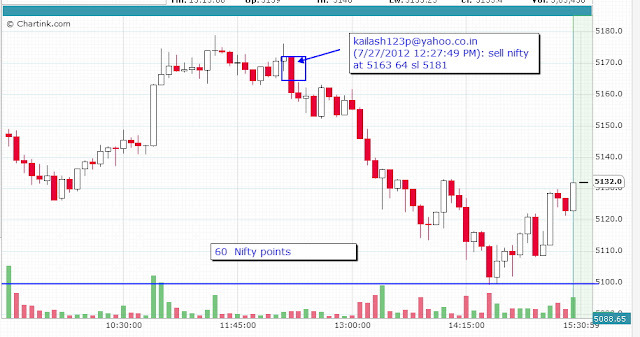 Gap down opening can not be ruled out as eod data is showing that FIIs turned bearish yesterday . 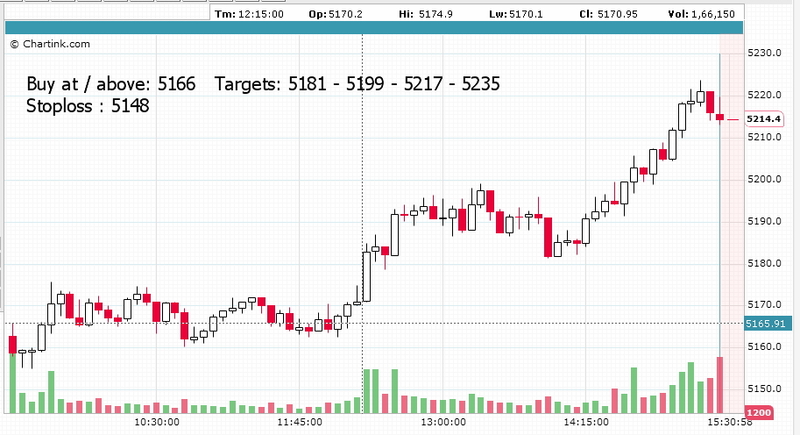 U.S. stocks sank Tuesday, resulting in the third straight session of triple-digit losses for the Dow average, following a report that Greece is still unable to pay off what it owes and will need to go through further debt restructuring. Market may settle at or above 5100 today as per option data ..there was no major change in nifty futures oi on 24 th . Flat to positive opening is expected with chances of smooth up move...the reason for that is we are not finding fresh short build up in futures but huge long unwinding was observed on yesterdays trades ... fiis were net buyers . 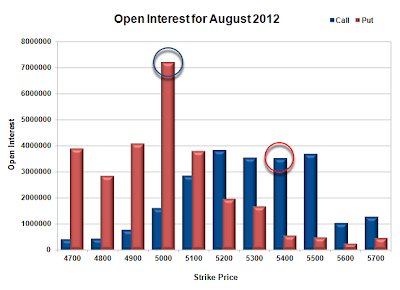 more over they bought index options of 2900Cr plus ..
Trade levels for nifty futures ..